Have you ever been so busy that you become miserable? Not miserable as in depressed, but miserable as in sad and mad that you don't have time to do or enjoy the things that really matter? Well, that's where I am this week. Just two weeks ago I was overjoyed with where my life has taken me. Tiny B is finally tube-free truly (without even a hole in her tummy anymore), I am homeschooling (Oh, how I love this! I wish I could describe to you just how much I love this), I made it through a very rough spring and summer and my heart is finally healing from the loss of my beloved poodle of my heart, and my new poodle is like total visual evidence that God does take care of our hurts and gives us beautiful gifts...But this week I realized just how busy busy busy we are and how much that needs to change. Some people thrive on busyness, and I'm realizing just how much I am not one of those people. So I have been really looking at the things that I love in my life and need my time, and that includes homeschooling and Mother Goose Time (I truly mean this from the bottom of my heart...what a gift both are to me), my family, my health and fitness, and bible study. The rest really needs to be looked at and some things will stay and some will go. I envision a life for us that is built upon God, love, and purpose, and for our family, we need to spend time creating each of those things and not rushing through them. I guess that sort of pertains to what I'm going to talk about in my next two blog posts. 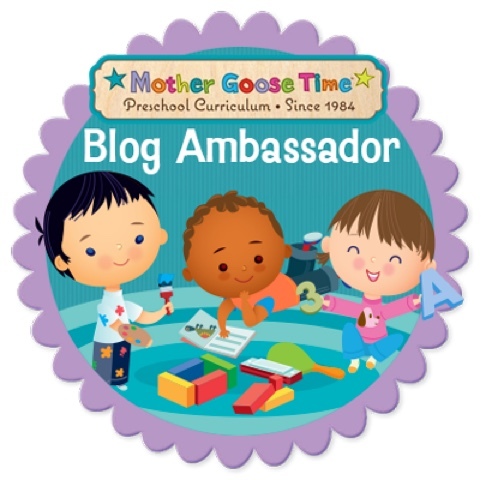 The Mother Goose Time community has really been delving into what process-based art is. 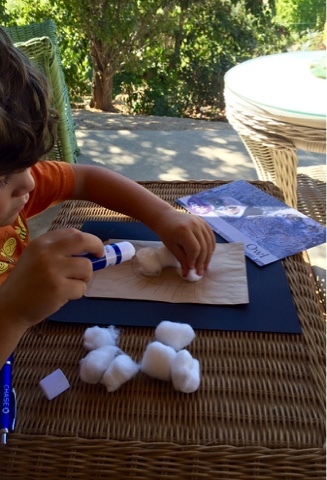 The art in the curriculum now is about 50 percent process-based art and 50 percent product-based art. In this post, I just want to simply show you a process-based art project. When I see them pop up in the curriculum, my first inclination is to take a deep breath and exhale, and prepare myself for the relaxation and deep-thinking that is about to take place. 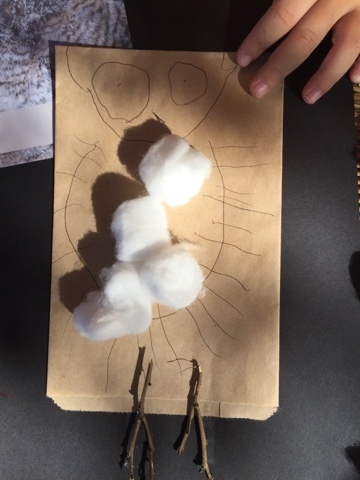 Process-based art is art that focuses on the process of creating, allowing the child to be in charge of what their end product will look like, and the emphasis is put on creating the product rather than the end product. Product-based art is art that focuses on certain skills and the child's goal is to have a nice-looking end product. Both have their place and I'm so thankful that MGT is doing both. 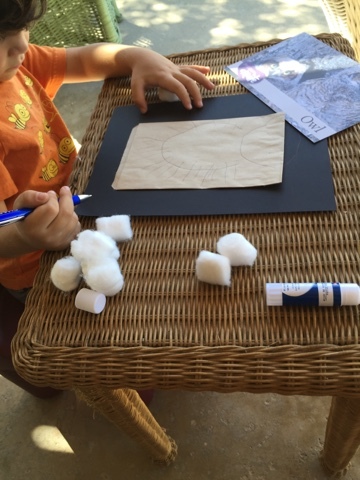 MGT's Invitation to Create is an activity that I can set out for Strong B while Tiny B does her kindergarten lessons. I know that he can enjoy himself for a long time doing this, and the best part is that I don't have to guide him much if I don't want to or can't. It's also an activity that I can simply hand to my mom when she comes over to babysit. She is an artist and loves it, but even if she wasn't, it is still very easy to manage. This summer she took a Waldorf art class for teaching children art. Everything that she learned is what MGT is doing. In my next post I will get into the philosophy behind process-based art but for now, here is simply how it was done. 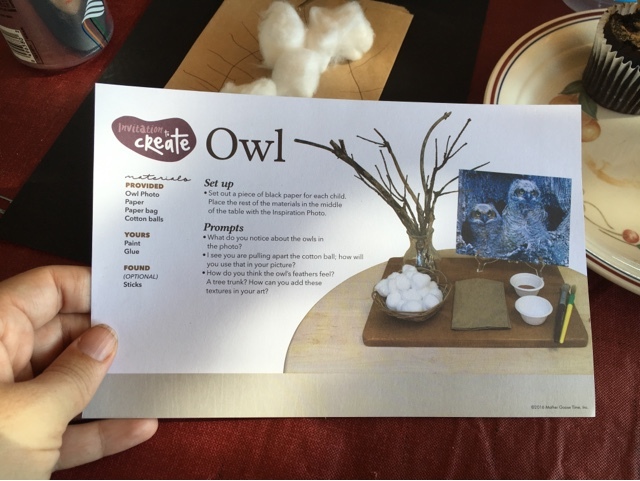 I gave her the Invitation to Create card with the instructions. She discussed owls with him and showed him pictures of the owl. He drew an owl. He used the materials however he wanted. She watched. 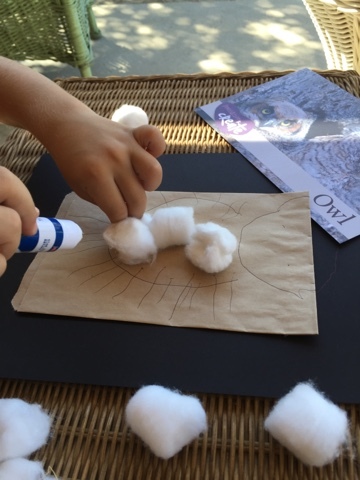 He glued cotton balls onto his owl's tummy. He took some twigs and made them into feet. I asked my mom if she drew the owl. She said that she didn't and that he did it all himself. I looked at the detail and loved how he drew the feathers and the wide eyes. I also loved how he chose twigs that looked so much like feet. They both really enjoyed it and he got a chance to truly think about what an owl looks like and what he wanted his owl to look like. There was decision-making and creativity happening. We've since done several Invitations to Create and he loves not being told what to do and how to do it. He spends so much longer on these projects than he does on the product-based art. I can see that he feels like a true creator during and after these projects, and he feels an ownership over the end-product.